Along with the list of ultra hardy roses in the Winterizing Roses article, we've got a few more, and some tips on selecting roses. See some of the previous American Rose Society top performers for zones 4 to 7, below. 2008 Rose Winners, 2007 Rose Winners, 2006 Rose Winners, 2005 Rose Winners, 2004 Rose Winners, and Rose Winners as far back as 1940 too! Roses are usually sold as two-year-old, field-grown plants. They are graded according to vigor and size. The main grades are 1, 1 1/2 and 2. Number 1 grade is the largest, and each succeeding grade represents slightly smaller plants. The size of top grades will vary with variety, but always select only the top grade available for the desired variety. A number 1 grade will have at least 3 canes approximately 3/8" in diameter. Most nurseries handle only 1 and 1 1/2. These grades normally are worth the extra investment. They produce more vigorous plants with abundant flower production. "Bargain" roses, sold at extremely low prices, are often culls from the growing field and are below the grading standards for the lowest grade. Extreme care in selection is advised. They are not generally a bargain. Bare root — Roses may be purchased bare rooted from local nurseries, mail-order nurseries and many other stores. When selecting these plants in a store, make sure that the canes are plump and green with smooth, unshriveled bark. If roots can be seen, select a good, well-balanced root system with a fresh appearance. A plant in good condition will feel heavy; a dried-out plant will feel lighter and twigs will be brittle if bent. There should be NO leaf growth on a bare root plant. If you plan to purchase rose plants from a local store, select them as soon as possible after the shipment has arrived. Stores are often too warm and the dormant rose plants soon develop premature, weak growth. Over a few weeks, this can weaken or even kill the plant. Ensure that your mail-order bare root rose plants will arrive in April-May timing so they can go straight into the ground. You don't want them sitting around in too warm or too cold conditions waiting for planting time. Container — Plants started in containers can be purchased and planted at almost any time during the growing season. Plants can be selected in flower and planted for immediate effect. Only container-grown plants in fairly large containers should be purchased. Number 1 roses should be purchased in at least a 2-gallon container. Number 1 1/2 or 2 plants should be in at least a 1-gallon container. Field-grown plants that are potted in small containers often have too many roots removed to develop vigorous growth after planting. See also the ultra hardy roses in the Winterizing Roses section. American Rose Society Recommended - Zones 4-7. These are the most popular of all roses today. It originated from crosses between hybrid perpetuals and the tea rose imported from China in the 18th century. Flowers are large, many with a delicate fragrance. Plants are vigorous, but not as hardy as most of the "old-fashioned," shrub or hybrid perpetual roses. These were developed from crosses between floribundas and hybrid teas. This group combines the free-flowering characteristics of the floribundas with the size and quality of the bloom of the hybrid tea. These were developed from crosses between hybrid teas and polyanthas. Flowers are intermediate in size between the two parents, but they have the same form and substance as hybrid teas. They are slightly hardier than hybrid teas and produce more flowers. They tend to grow lower and bushier than hybrid teas, which makes them suitable for mass plantings. Flowers are smaller than the floribunda but borne in larger clusters. Plants are hardy, bushy and relatively disease resistant. They are excellent for mass plantings and borders. Varieties are more limited and flowers are not as suitable for cutting as the previous types. Outstanding varieties available include China Doll, The Fairy and Mrs. R.M. Finch. These are dainty little rose plants - replicas of their larger relatives. Flowers are small and plants range from 6 to 12 inches in height. Leaves and even thorns are perfect miniatures. Plants are bushy and most are quite hardy. They are useful for low edging and in rock gardens. Many varieties are available from specialists in many colors and blends. These include all varieties of roses that produce long, vigorous cane growth that can be trained on fences, trellises or posts. Climbing roses don't climb in the sense of many other plants. They don't twine or have tendrils that make them self-supporting. Several different categories of climbing roses are available with slight differences in hardiness and culture. The "Shrub Rose" term is often given to a miscellaneous group of species, hybrids and varieties. They have also been listed as "old-fashioned" roses although new varieties have been developed. They are a hardy group of roses with a wide range of flower forms and colors. The vast number of other species, hybrids and their varieties are too numerous to mention here. Among them are the Sweetbriar rose, Cottage rose, French rose, Father Hugo rose, Apple rose, Scotch rose, prairie rose, Virginia rose and memorial rose. Most of these are available only through specialists. *All America Rose Selection Winner. 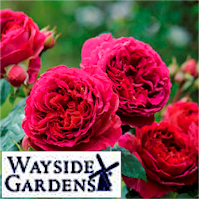 **American Rose Society Award of Excellence.